“The Secret Adversary” by Agatha Christie, is her second published work after “The Mysterious Affair at Styles” and like the later it first appeared as a series of seventeen episodes in “The Times” – weekly edition during August – December, 1921, followed by publication in the book format in 1922. 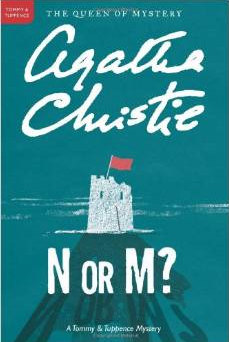 In this novel, Agatha Christie introduced the readers to the adventurous pair of Tommy and Tuppence for the first time. We meet the pair in London of 1919 where jobs are scarce and living is difficult in the post-war aftermath. Predence Cowley aka Tuppence and Tommy Beresford meet by chance and in their desperate attempt to earn money establish the “Young Adventurers Ltd.” in a restaurant. But, as their luck would have it, Tuppence is asked to participate in an adventure by a man named Whittington as soon as she comes out of the restaurant. She goes to meet Whittington and scares him by giving her name as “Jane Finn” which results in ending the meething abruptly. Together, Tommy and she decides to gather information about this “Jane Finn”. In this quest, they meet two characters: one, a British intelligence man who calls himself Mr. Carter and tells them the story of Jane Finn. Jane Finn, on her journey from America to England, was charged with highly secretive and important documents by a man called Danvers on the ship Lusitania when the ship was torpedoed and sunk during the war. Danvers knew that as a woman, Jane’s chances of survival were more than him and he was proved right as he was found dead later. The mystery is that this woman “Jane Finn” has disappeared since and so have the documents. They also meet Julius Hershiemmer, Jane’s cousin from America and together they all start working towards unfolding the mystery. The second link in the chain is Mrs. Marguierite Vandemeyer or “Rita” as she is widely known as. While trying to trace her, Tommy and Tuppence see Whittington once more. Tommy, while following Whittington, finds out a secret house where the current gang of supporters of soviet revolutionaries is working. They are seeking the documents carried by Jane Finn in order to unsettle the current government and bring the revolution. The leader of this gang is a man called Mr. Brown, whom nobody has ever seen. He is the secret adversary. Tommy is caught by these men and is kept as a prisoner in that house. Meanwhile, Tuppence gets a place as a housemaid in the home of Rita Vandemeyer and meets Sir James Peel Edgerton, K.C. who advises her to find a new place. Worried by Tommy’s disappearance, Tuppence goes to Sir Edgerton and tells him everything. When she goes back to Marguerite’s house, she finds her all prepared to flee. She forces Tuppence to drink a sleeping draught on point of a revolver, but in a quick manuevre, Tuppence gets hold of the revolver and offers her a bargain: A huge sum of money in lieu of information about Mr. Brown. But, at that moment Sir Edgerton and Julius arrives and Marguerite faints. She never wakes up. The doctor declares next morning that she died due to overdose of sleeping draught. After this death, Julius, Tuppence and Sir Edgerton go to meet Dr Hall who informs them that Jane Finn had been admitted to her nursing home after her arrival in England under the name of Janet Wandemeyer. The girl had completely lost her memory (like Bollywood) and was under her care for a long time but had been removed only recently. On coming back to the hotel, Tuppence recieves a telegram signed by Tommy, and leaves to meet him. Meanwhile, Tommy manages to escape from his prison with the help of a French servant girl called Annette. Upon returning to the Ritz, Tommy and Julius recognize the telegram to Tuppence as a means of getting her out of the way. They retrieve the telegram, but fail to find any trace of her at the address given. While the boys are searching for Tuppence, they receive a message from Sir Edgerton that he has found Jane Finn and that she has gained her memory back. Excited, they go to meet her, but the meeting results in only disappointment as they don’t find any secret document at the place indicated by her. What awaits them instead is Mr. Brown’s complements. To add to the sad news, Tuppence’s clothes are found on the seashore. So, the villains have got the documents, Tuppence is supposedly dead and the adventure seems to have ended. As expected, since nobody thought that two young brains could be a match for the most elusive and clever villain of the time, the omnipresent Mr. Brown, who seems to know about their every move. Well, not quite. This is an Agatha Christie story and a lot of adventure and unraveling of mystery is yet to follow. The adventure proves to be successful in more than what the founders wished for, as at the end of it not only they earn money and fame, they also find love and life partners in each other. Enjoy the thrilling and sometimes humorous journey of the young adventurers to end in a happily-ever-after……..
“To all those who lead monotonous lives in the hope that they experience at second hand the delights and dangers of adventure“. Very true….